The Westside UU Social Justice Council coordinates the social justice efforts of the congregation in recognition of the need to work together for the common good and against all forms of systemic oppression. We do this compassionately through communication, education and action on issues that threaten the attainment of justice, health, and well-being of people and the planet. See below for more information about the Council including objectives, membership, structure, duties and responsibilities. We are organizing many activities that support the common good. We ask you to join us. The Social Justice Council meets monthly on the first Thursday at 7:00. Check church calendar for room. The Racial Justice Task Force meets monthly on the first Mondays at 7:00. Check church calendar for room. Based on the Unitarian Universalist belief in the principle of the inherent worth and dignity of all human beings, Westside along with the Unitarian Universalist Association and other UU churches around the country stand committed to racial justice and supporting the Black Lives Matter movement. 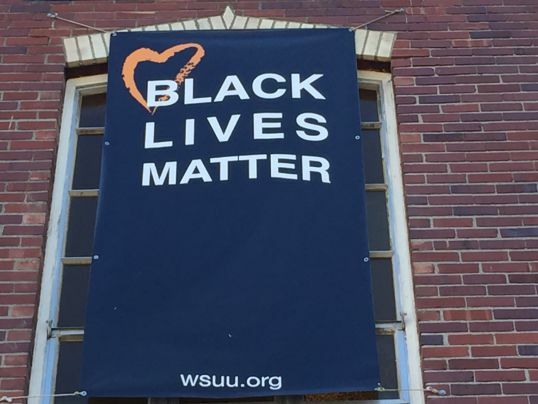 In December 2015, in a congregational vote, WSUU approved the addition of a Black Lives Matter banner on the exterior of the church. In 2015-2016, a 6-month workshop on institutional racism and was offered at WSUU. WSUU continues to explore ways in which it can be involved in promoting racial equity within our community. Contact us for more information and ways to get involved in racial justice work at WSUU. The Westside Environmental Justice Group raises awareness about climate justice, and we take action in numerous ways. We schedule speakers; provide information through newsletters and tabling and encourage participation in community events such as the October 2016 Faith and Climate Action Conference. We take action by testifying at environmental impact statement hearings, by marching and participating in rallies, and by contacting our elected officials about environmental legislation. We provide educational programming about climate change through adult and student activities and events such as the Plant for the Planet Academy. We work with other UU congregations and environmental organizations to plan and coordinate important educational events such as the November 2016 Anacortes Rail Spur Informational Forum. 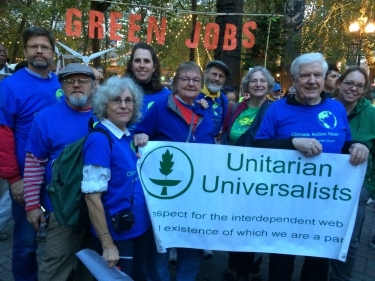 As Unitarian Universalists, we take action because we are called to do so and because we care about the interconnected web of life; we care about the planet and we care about people. The Westside Environmental Justice Group draws inspiration from this definition of climate justice created by the Unitarian Universalist group Commit2Respond. Westside is committed to social action within our community. We have worked for marriage equality, and as part of a congregation-wide Food First initiative, provided meals and clothing for the homeless in camps, shelters, at Orion Center Youth Services, and supported our local food banks. Providing social justice information to Westside congregants at a table in the social hall after Sunday service. 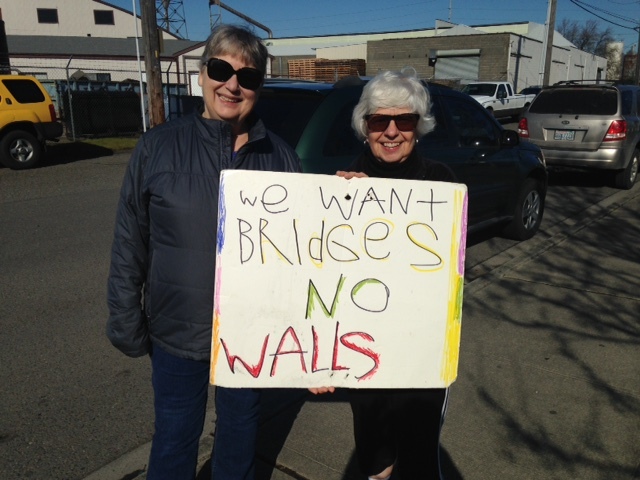 Supporting the Westside Interfaith Network (WIN) Welcome Table on Saturdays in White Center by hosting lunches and clothing collections for homeless and those "living on the edge" of homelessness. 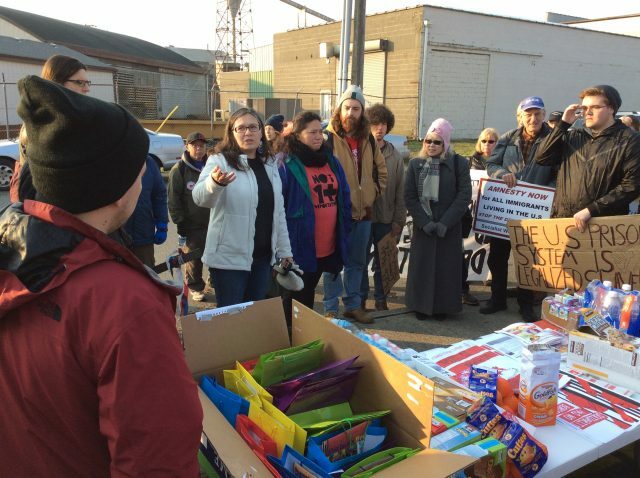 Organizing support vigils at the Northwest Detention Center in Tacoma. Holding Christmas drives for donations to organizations that help those in need, such as the shoe voucher program at Mary's Place and a winter clothing drive for the Welcome Table. 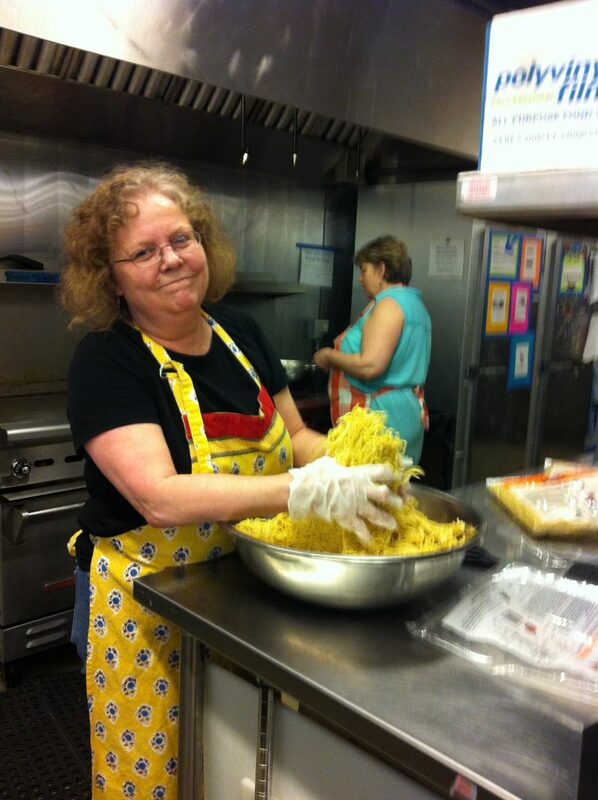 For more information about volunteering in Westside's community service programs, contact Regina Brennan. Westside works to secure justice for immigrants. 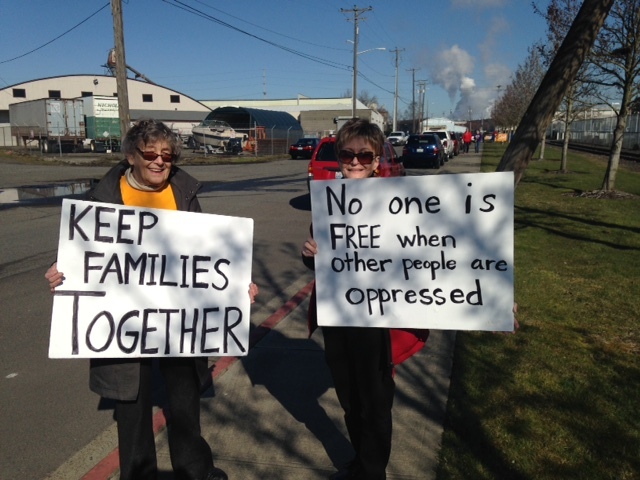 We do this through educational events and by bearing witness at the NW Immigration Detention Center. 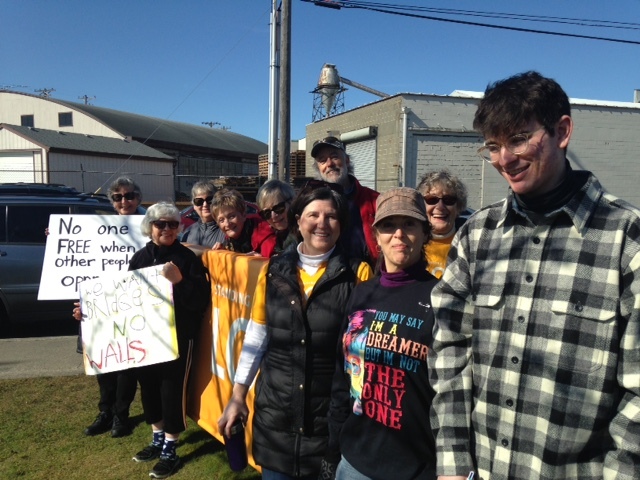 The Detention Center can be an intimidating and threatening space for those who wish to visit detainees. Some visitors drive for hours and risk being detained themselves. On the fifth Saturdays of the month, we support these families and individual by sharing coffee and refreshments and offering information about the rights of detainees and pathways to citizenship. Email Tracy Burrows at teburrows@zoho.com if you’d like to join us in working on these issues. The Westside UU Social Justice Council coordinates the social justice efforts of the congregation in recognition of the need to work together for the common good and against all forms of systemic oppression. We do this compassionately through communication, education and action on issues that threaten the attainment of justice, health, and well-being of people and the planet. Membership -- The Social Justice Council will consist of at least 4 active members and friends of the congregation and a maximum of 9. The Council shall have a Chairperson. Members of the Council shall select their chairperson yearly and submit the name for confirmation by the Board of Trustees. Ex-officio positions will be the Minister and a liaison member appointed by the Board of Trustees. Meetings -- The Social Justice Council will meet once a month and meetings are open to visitors. All decisions of the Social Justice Council will be by majority vote of those members present. The Chair shall vote only in the event of a tie vote, to break the tie. A quorum three Council members must be present to conduct business at a meeting. The Council shall undertake the completion of projects of three types. Denomination-to-Congregation: Any ongoing project involving action taken at the UUA General Assembly, viz. Study/Action Issues for Social Justice, Actions of the Immediate Witness, and Resolutions. It is understood that Council support of a project does not necessarily imply Congregational support of, nor commitment to, that particular project. The Council shall not make public statements purporting to be in the name of the Congregation (unless the project is an all-Congregational activity) but shall act and speak only in the name of the Council. The Chair shall be the official spokesperson for Council unless others are designated by the Chair or Council. Any person proposing a project to the Council shall be responsible for presenting to the Council a general project time-line (including evaluation of the project as it progresses) and a Project Leader who will carry out the project with appropriate assistance from the Council. Before a project is implemented by the Social Justice Council, it shall be submitted to the Minister and the Board of Trustees for review, in order to ensure that the project is in compliance with the WSUU’s tax-exempt status and that it is not in violation of the Seven Principles of the Unitarian Universalist Association. The circulation of a petition must be approved by the Social Justice Council and must be in compliance with the WSUU’s tax-exempt status and consistent with the Seven Principles of the Unitarian Universalist Association. Groups circulating petitions must understand that they are not speaking/acting for the WSUU. If an individual member wishes to gather signatures, they must find or create a sponsoring group that is recognized within the WSUU. The Social Justice Council (SJC) chair/s must be notified of the petition and group sponsorship by email ten days prior to circulating. If something urgent arises, contact the SJC as soon as possible so that the Council can read it and have a copy on file. The Chair will facilitate each meeting (or appoint a facilitator to fill in). The Chair shall be a member of the Church. A list of participating members and a list of ongoing Projects with the name of the Project leader, the Project timeline, and pertinent details of the Project will be posted on the Congregation website. The Social Justice Council will submit to the Board of Trustees an annual committee report that summarizes activities of the past year.